The acquisition of Frutarom by fellow flavours giant International Flavors & Fragrances (IFF) has moved a step closer after receiving clearance from all relevant authorities around the world. Ingredients firms are finding inventive ways of creating ever more striking colours and flavours – while keeping it natural. A taste modulator that can mask a wide range of flavours in liquid-based products was unveiled at last November’s Food Ingredients Europe in Frankfurt. Israel-headquartered food ingredients firm Frutarom has secured a loan of £14.75M to support its acquisition of UK-based manufacturer Flavours & Essences (F&E). A bacon product free of cancer-causing nitrites is to launch in the UK following a £14M investment by Northern Irish meat processor Finnebrogue. Black truffle flavoured crisps and berry Slush Puppies, plus a host of other festive-themed food and drink, lead our latest photogallery of new product developments. Visitors to this month’s Food Ingredients Europe (FiE) are being invited to go on an interactive journey into the world of taste at Symrise’s stand (hall 8, stand A69/79). A natural flavouring that “builds back” sweetness in reduced sugar products is now available from Kerry. A series of trials to reduce the sodium content of plant-based, vegan and vegetarian meat alternatives has been completed successfully by Salt of the Earth. Nine new fat-soluble flavours for fillings in confectionery, bakery and dairy products have been launched by Sensient. Israel's reputation for innovation in hi-tech industries can now be extended to food. Mounting pressure from health groups hasn’t deterred consumer desire for ‘feelgood’ foods. Disney cake kits and Pink Panther biscuit wafers lead Food Manufacture’s latest photogallery of recent food and drink product launches. Food manufacturers are not doing enough to reduce high levels of salt in their product, claimed pressure group Consensus Action on Salt & Health (CASH). The trend towards natural colours and flavours brings challenges as well as opportunities. 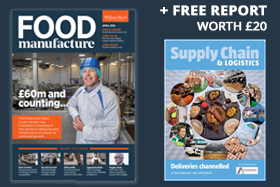 Click here to search for the products, services and companies you need in the definitive guide to the UK food and drink manufacturing industry.